Prague is a 1,200-year-old city preserved in time, and, unlike other Central European capitals, it was not bombed during the 20th-century wars. On your GUIDED SIGHTSEEING TOUR, see its best-known treasures, such as the Old Town’s Astronomical Clock, dating from the 15th century and once the envy of all of Europe; HRADCANY CASTLE GROUNDS; St. Vitus Cathedral; and the Charles Bridge, the oldest bridge in Prague. Browse the shops for hand-cut crystal or art books. Mix with the locals in Wenceslaus Square, an important meeting point where people demonstrated against the communist regime; watch performers and shop at the market stalls on Charles Bridge; wander around the medieval Old Town, dating from the 10th century; sample the local plum dumplings and Pilsner; or stroll along the Vltava River. Your Cruise Director will have more suggestions for you. After lunch, drive to Nuremberg, where your river cruise vessel is docked. Before dinner, meet your crew for a welcome reception. In the early morning hours, arrive in medieval Bamberg, former residence of one of Germany’s most powerful imperial dynasties and today a UNESCO World Heritage Site. Your GUIDED WALK takes in its historic center, including the great 13th-century Romanesque cathedral and the fascinating Altes Rathaus (Old Town Hall)—built on an island in the middle of the Regnitz River when the bishop refused to give the townspeople land for a town hall! This afternoon, enjoy some relaxing time on board as you cruise toward Würzburg on the Main River. Arrive in Würzburg during breakfast. Surrounded by verdant hillside vineyards, Würzburg, also known as the “Pearl of the Romantic Road,” makes an immediate impression with imposing Fortress Marienberg perched above town and the 15th-century Alte Mainbrucke (Old Main Bridge). On your GUIDED SIGHTSEEING TOUR, visit the magnificent baroque BISHOP’S RESIDENZ, home to the largest ceiling fresco ever painted. This afternoon you might like to join an optional excursion to medieval Rothenburg. On the banks of the Main River you find cultural gems of small towns, many of them tucked away behind defensive walls and towered gates. Half timbered houses, narrow streets and medieval town centers, these picturesque Bavarian villages are a photographer’s delight. Join your Local Guide to experience one of these towns on a GUIDED WALK. Pretty Rüdesheim is the perfect example of a Rhine Valley wine town, and SIEGFRIED’S MECHANICAL MUSICAL INSTRUMENT MUSEUM is a real surprise. Enjoy a SPECIAL TREAT, then there’s free time to explore the Drosselgasse and pick up some souvenirs. Downstream,the dramatic RHINE GORGE is the most beautiful stretch of river. Pass the legendary rock of the Lorelei, where sweet songs of local beauties lured enchanted sailors to their doom. Early this morning you arrive in the charming wine village of Bernkastel on the Moselle River. With its fascinating narrow streets and half-timbered houses that have stood since the Middle Ages, you’ll enjoy a GUIDED WALK that includes the beautiful marketplace with its renaissance-style Town Hall—built in 1608—and the “pointed house,” built in 1416. The Moselle is famous for its wines, and growers in this area look after Germany’s largest expanse of vineyards, the most celebrated of the vintages being the Bernkasteler Doktor. This evening enjoy a TASTING of some of these well-loved German wines. After breakfast, an excursion takes you to Trier, Germany’s oldest city. Some say Trier is even older than Rome and that it was populated over a thousand years before the Romans arrived. Many Roman remains have survived, including a 20,000-seat amphitheater; the Porta Nigra, the only surviving fortified gate from the original Roman settlement, which still gives access to the town’s center; imperial baths; and the Roman bridge, Germany’s oldest bridge, with stone pilings dating from 144-152 AD—all evidence of this once grand Roman city. Trier also offers pleasant market squares, Germany’s oldest Christian church, and a cornucopia of architectural styles—Roman, baroque, neo-classicism, renaissance, and gothic. A choice of included CITY SIGHTSEEING or the more history-focused “ROMAN TRIER” guided tour, followed by some free time, give you the opportunity to discover this magnificent town. Rejoin your vessel and head for Remich in the Grand Duchy of Luxembourg. Reach Remich in the early morning hours and say goodbye to your crew after breakfast. 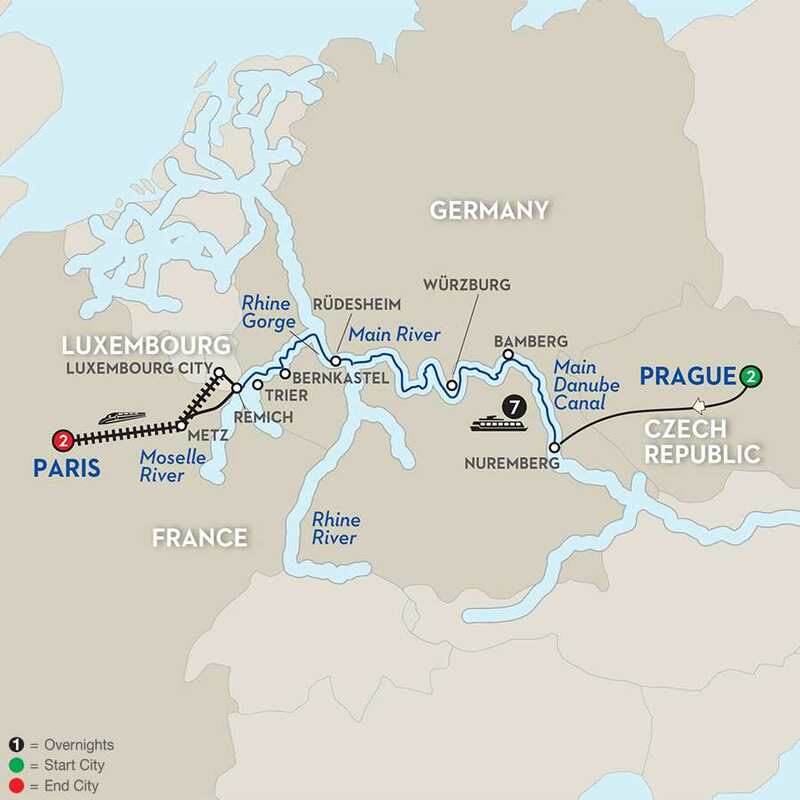 Travel to Luxembourg City or to Metz to board the HIGH-SPEED TRAIN to Paris where you arrive later in the day. Known as one of the world’s most romantic and lively cities, Paris is a delight for all your senses. Your INCLUDED CITY SIGHTSEEING shows you magnificent must-see sights, such as Notre Dame Cathedral, the unique Louvre Museum with its glass pyramid as a contrast to its ancient architecture, the commemorative Arc de Triomphe, and the Eiffel Tower. In your free time, stroll down the Champs-Elysées, with sprawling sidewalks, and lavish cafés, or perhaps visit the world-famous Louvre museum, or Montmartre with its gleaming white Sacré Coeur Basilica and bevy of artists on Place du Tertre. Paris is also well known for its colorful nightlife and an optional outing to one of the world’s most famous cabaret shows is available. All of this awaits your discovery! Attend a tasting of the region’s Famed Moselle wines. Contemporary 9-story Hotel situated in old Jewish Quarter, across the road from the Vltava River. Terezin Memorial Terezín was established at the end of the 18th century as a fortress; it is still surrounded by its massive ramparts. Only in the relatively recent past has Terezín entered the world’s public consciousness as a tragic symbol of the suffering of tens of thousands during the Nazi regime. Visit the Fortress with its infamous Gestapo Prison and learn more about the saddest chapter of European history in the “Ghetto Museum” of Terezin with its moving collection of drawings and artifacts made by the children who were growing up under the worst of conditions. Detailed commentary is given by your local guide to supply the essential background stories. A genuine, true educational must, an eye-opener to European history. Rothenburg ob der Tauber on the Romantic Road If you had to pick only one place to visit in the whole of Germany, it should be Rothenburg. The best preserved medieval town in Germany, Rothenburg ob der Tauber fits the word “romantic” perfectly. The entire walled town of Rothenburg is a living museum. The town wall connects five medieval gates complete with guard towers that date from the thirteenth to sixteenth centuries. Just walk along Rothenburg’s narrow cobblestone streets and admire the gothic, renaissance, and baroque houses and fountains. You may wish that you had lived in these prettier, quieter, slow times. Climb to the top of the Rothenburg Town Hall Tower (circa 1250-1400) for a wide-angle view of Rothenburg and take pictures of the surrounding, mostly pastoral countryside. Walking in Rothenberg is like a step back into medieval times where one can feel the old roots of the continent. Not to be missed!